Jujiro Wada Memorial Association – Jujiro Wada Memerial Association is to honor the pioneering spirit of Jujiro Wada and pass on his accomplishments and filial duties to the next generation. A pioneer in Alasaka who came from Ehime, Japan. 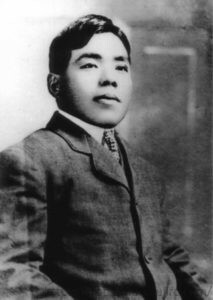 Jujiro Wada spent his childhood days in Hinode town on Shikoku Island. He embraced an ambition and it made him smuggle into the United States alone in 1892. He explored the Arctic Circle with a dog sled, which was an adventurer even the indigenous people were afraid of. He discovered lots of gold mines and oil fields, and left a great legacy in terms of the development of Alaska, and the Yukon area, an inhospitable land in those days. Meanwhile, he continued to be a devoted son to his mother Setsu in his hometown all through his life. Jujiro Wada Memorial Association’s mission is to honor and pass on Jujiro Wada’s accomplishments and filial duties to the next generation. It is estimated that in his life time, the total distance he traveled with his dog sled exceeded 44,000 km. 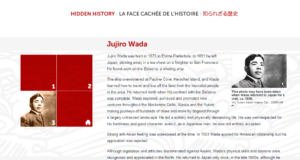 Yukon Government introduced Jujiro Wada as successful Asians in their website. 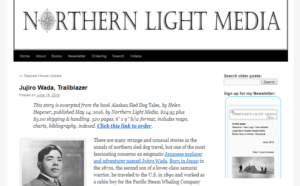 Northern Light Media introduced Jujiro Wada as a trailblazer of Araska in their website.